Bridget Bushong - I am with the baseball team. Because there are so many athletes I get to see a wide variety of injuries and consequently, treatments. MoBap has many different modalities so I'm able to practice using them for different purposes. 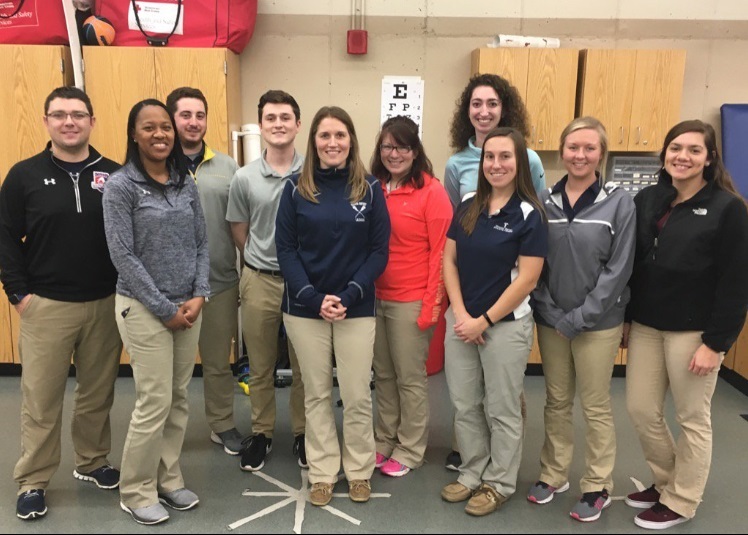 Being at a university has shown me a different side of athletic training because they have so many different team physicians they use. This semester I have been able to expand my skills in rehab and stretching techniques also. MoBap is a nice clinical site to be at this semester because I am learning so much and getting more hands on experience. CJ Butler - I am with the Missouri Baptist University wrestling team. Wrestling has been an interesting sport to cover from an athletic training standpoint because the athletes put tremendous strain on their body day after day with live wrestling, little rest and pushing through pain. They also are constantly trying to cut weight so helping them manage that in the best way possible has been challenging. This semester we have been learning the physiology and different methods for stretching and rehabilitation and I have been able to apply these functionally at MoBap nearly every day with battling frequent soreness and injuries to the athletes. My taping ability has also improved and I have started becoming more creative in the ways I tape. Wrestling causes almost any tape or wound care we apply to get damaged or come off, so learning how to quickly tape and get them back in while also using techniques that are durable has been essential. MoBap has been a change from my last site when our hands were the only modalities we had whereas I have been able to use Game Ready, cupping, estim, ultrasound, combo, scrapping, Normatec and ice baths daily. Ryan Dale - I have been working with the Men's Basketball, Men's Track, and Softball teams at MBU this semester. Most of my time outside of the Athletic Training Room has been spent covering Basketball games and practices, which has been exciting. I have really gotten to know the team well, and have formed trusting relationships with them. While working in the Athletic Training Room my focus with the Basketball players has primarily been assisting my preceptor (Ashley Broughton, MS, ATC) in keeping everyone healthy; We achieved this through preventative measures such as taping the athletes before games and practices and by providing plenty of postgame treatments on sore/injured areas. With Men's Track I have worked extensively with them on injury prevention through stretching and heating before practice as well as addressing any injuries before they become serious problems. Also there are a couple of injured athletes that I have been working with everyday to help them return to action. I have not worked with Softball too much yet, because I have been so busy with Basketball, but I look forward to helping them stay healthy and getting to know them. Overall I have gained a great amount of valuable experience and I have had a good time while doing it. 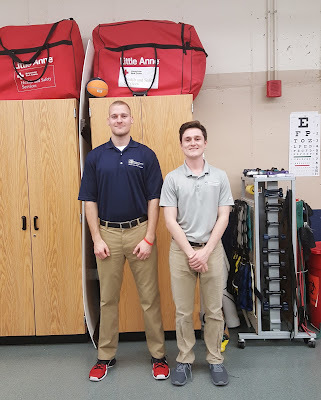 Ben Wildman - I am with Men's Lacrosse, Women's Track and Field, and Women's Cross-Country this semester under the guidance of my preceptor, Jamie Herron, MS, ATC, at Missouri Baptist University. Most of my time at MoBap has been split between covering Men's Lacrosse practice and spending time in the Athletic Training Room. 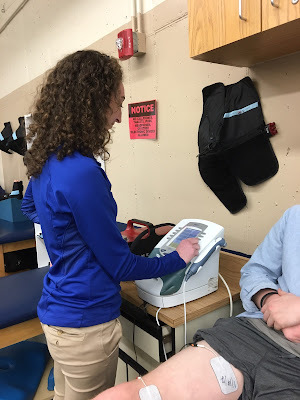 At practices we mostly address acute injuries and stretch our athletes. 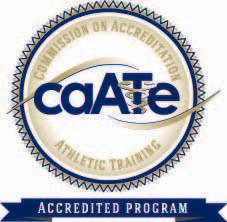 After practices we return to the ATR where I complete evaluations, apply manual therapies to aid the athletes in recovering, and do rehabilitative exercises and treatments. Our athletes are required to complete weekly bands which are preventative exercises that have been selected and catered towards their respective sport. Some of these bands emphasize prevention for ACL injuries, shin splints, and shoulder instability. These are injuries that can be considered rather common to the nature of the game of lacrosse. Therefore, preventing them through strengthening and ear1y intervention is essential. I have learned different manual therapy techniques such as myofascial release through scraping, cupping, and massage. I apply these techniques on a daily basis with our athletes to aid in recovery, pain management, and rehabilitation. My time thus far at MoBap has proven to be very educational, challenging, and fun.